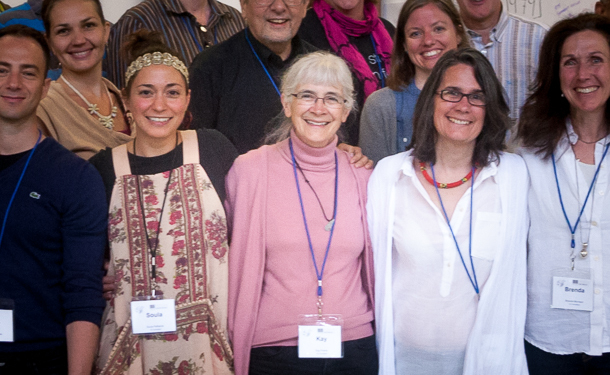 Expert Kay Pranis returns to Eastern Mennonite University Feb. 5-7 to teach a three-day, weekend course that will introduce the foundational values and philosophy of the circle process, as well as give students opportunities to practice facilitation and explore application. The circle process is one of the core foundational concepts of CJP’s training for peacebuilders and has been used with positive results in many regions with a history of long, entrenched conflict, Docherty says. “This is an important, transformative and deceptively simple process for engaging people around really hard issues,” she added. The course begins Friday, Feb. 5, from 6-9 p.m. and continues Saturday from 8:30 a.m.-5 p.m. and Sunday from 1-6 p.m.
Pranis first encountered peacemaking circles in the mid-1990s when studying with Barry Stuart, a judge in Yukon, Canada and also with Mark Wedge and Harold Gatensby, First Nations people of Yukon. Before that time, she worked six years as the director of research services at the Citizen’s Council on Crime and Justice. From 1994 to 2003, she served as the restorative justice planner for the Minnesota Department of Corrections. Since 1998, Kay has conducted circle trainings in a diverse range of communities—from rural farm towns in Minnesota to Chicago’s South Side. Pranis has written widely on the subject: two recent publications are Circle Forward: Building a Restorative School with Carolyn Boyes-Watson (Living Justice Press, 2014), and Doing Democracy: Engaging Communities in Public Planning with Jennifer Ball and Wayne Caldewell (Living Justice Press, 2010). More information about course content is here. For more information and registration, email Janelle Myers-Benner, CJP academic program coordinator, at bennerj@emu.edu.